Using literature to teach classroom behavior works so much better than just stating or displaying the rules for students. I have created three activity sheets to go with three of my favorite back-to-school books. They are asked to reflect and write about their past behaviors, and decide how they can improve this upcoming school year. It teaches why we shouldn't interrupt others. You won't get your way when you act out. 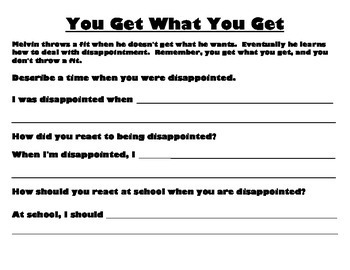 How should you act when you are disappointed? If you listen more than talk, you may actually learn something interesting. You can read the books and do the activity sheets whole group or complete in literacy centers. Allow the students to share if they want. l use the characters in the books as examples of what not to do throughout the school year.